Finding losing weight an uphill battle? No matter how much you exercise – try three hours a day – and how little you eat – salad and plain pasta for me – the weight is not dropping. In fact, with all that exercise you’re doing, you’re more hungrier than ever before. There must be a better way to lose weight healthily? It’s called a keto diet. The idea behind going keto is to set up your macronutrients so that the most significant percentage comes from fat (60-75%), followed by protein (15-30%), and leaving just a sliver of carbs on the macro pie chart (5-10%) that represents your dietary consumption following this plan. Getting an account with a nutritional tracker like myfitnesspal will allow you to customize your macros, so you’re sure to be hitting them on target each day. The average American consumes a carb-loaded diet, and keto completely turns our food pyramid upside down. Why is that? There have been scientific studies that have concluded that the rise in Type 2 diabetes, heart disease, cancer, Alzheimers and all “those” diseases you attribute to old age, is in fact a result of the high consumption of processed food – mainly carbs. To learn more of the science of low carb, check out this site. 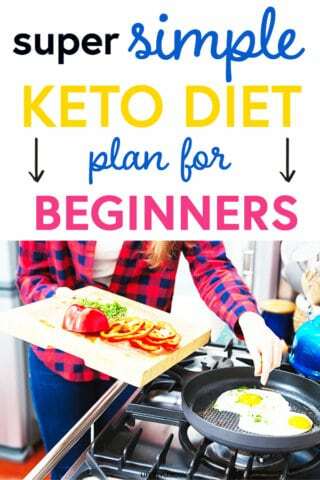 There is a keto diet plan for beginners that can get you on the right path for success. Note: I am not a doctor, so please consult your doctor before trying a new diet plan as drastic as the keto diet. Keto has become a trendy diet in recent times and for a good reason. It works if you’re willing to give it a solid chance! When you eat a keto diet, your body ends up going into ketosis. Once your body is deprived correctly of carbs after a few days of following a keto diet for beginners, it will have no choice but to start eating up all your extra fat reserves. Thus transforming you into a lean, fat-torching machine! On the keto diet, by eating mostly fat, you will actually lose weight, have more energy, feel far less hungry, and even think more clearly! “Fat” has become such an ugly word in our society because we’ve been ingrained with this idea that fat makes you fat and will ultimately be the death of you should you consume too much of it. To the contrary, experts and keto followers are weighing in and suggesting that it is actually our carb addiction that is the sneaky perpetrator for weight gain. Sure carbs may feel friendly and sweet to consume, but they are your foe in hiding and trying to take you down one donut at a time. Ever noticed that the more carbs you consume, the more you want and the hungrier you feel? Yeah, that’s carbs for you. Delectable but highly deceiving little creatures. When we don’t burn off all the carbs we eat through exercise and activity, our bodies end up converting that stored energy to fat because it hasn’t been used. Fat, on the other hand, is immensely satisfying and filling to eat and your body will naturally tell you when it has had enough. So let’s drop the bread, pasta, and cakes and eat more fat to be less well, fat! If you don’t want a sluggish body to turn into your ultimate demise, a keto diet plan may be your ticket. Let’s not fool ourselves though. It probably won’t be easy at first making this kind of transformation, but if you put in a proper effort for a couple weeks to a month, you will notice some drastic changes. It’s going to take some will power and some guts, but you got this chica! Pro-tip: to start a keto diet, the easiest way to do this is to make sure you that you are consuming enough healthy fats like coconut oil and avocados so that you don’t feel hungry during this transition. Give it a couple days for the intense carb cravings to subside and you’ll be rolling on your way to the gravy train. Yes, on this diet you can have unlimited gravy with your roast and steamed veggies! 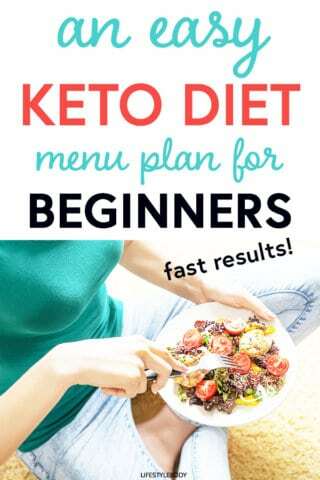 A keto diet menu for beginners includes lots of easy to reach for items like nuts, avocados, high-quality full-fat dairy (yogurt, cheese, butter, cream), fatty cuts of meat or fish, eggs, and 90% dark chocolate. Even healthy whole grains, fruits, and vegetables with a high carbohydrate count are forbidden on keto. A bowl of cereal or a couple bananas alone will nearly put you over your carb allowance for the day, so you’ll want to save your carbs for eating some necessary greens. Marinate your meals in coconut, avocado or olive oil, eat cheese, cook with ghee or grass-fed butter, don’t toss the fat trimmings on your cuts of meat, and you’ll be on the right track. Just remember to say no to starches like bread, rice, and potatoes. Even in a short period following a keto diet meal plan you’ll reap some serious rewards. Your tummy will get flatter, you’ll notice you have fewer food cravings, you won’t feel as hungry but will have more energy to slay every day, and the stream of compliments from friends and family will start flooding in as they notice a change in you radiating from the inside out. Don’t be scared to add a healthy dose of natural or almond butter to a satisfying smoothie, sprinkle some cheese on your coconut oil infused scrambled eggs, or make some baked avocado eggs. These are just some lowkey ideas to get you started. A keto diet for beginners can be simple and highly rewarding. If you’re ready to take the plunge and test the keto waters for 14 days, this keto diet menu will hopefully inspire you and set you up for success. This one pot sesame chicken and broccoli will get you started on the right foot with simplicity and ease. Did someone say taco Tuesday? This chili lime fiesta chicken is sensational and packed with all the right flavors. This skillet roasted Brussel sprouts with bacon and parmesan are sure to delight and be devoured. This is an excellent idea for when you’re craving some Asian cuisine, and it’s so tasty even though it has no rice or noodles to weigh you down! This cauliflower rice with chicken is quick and easy but is far from short on taste. We are big on fresh-caught salmon in our household, and this cilantro, lime, and honey-glazed fish is sure to be a catch with your family. Burgers on a Sunday at a sunny barbeque just feel so right, and these are sure to pack some heat. Zucchini noodles shrimp alfredo will make you obsessed with this green noodle alternative. Back to a keto take on taco Tuesday. There’s no missing out on your favorites here! This blackened steak with avocado, blue cheese, and bell peppers resembles something you’d get in a fancy restaurant with its presentation and delivery. This mini bacon wrapped meatloaf is a great excuse to have bacon for breakfast AND dinner. Plus, the mini two-bite ‘loves’ are kid-friendly! This chicken with spinach and mushroom in parmesan sauce is creamy and comforting and sets you up for a laidback night of Netflix and Chill at the end of a busy work week. Who doesn’t love a charcuterie soiree? Enjoy a naturally low carb dirty vodka or gin martini and feel swanky with this spread. Eating a delicious steak on Sunday feels like a beautiful way to celebrate another amazing week of challenges and triumphs gone by. These keto dinner recipes are anything but lacking and will hopefully inspire you to keep going with this lifestyle that can do wonders in a relatively short time for your bod and brain. Once you lose the cravings for carbs, the keto lifestyle will become a no brainer and you might become hooked! Which recipe are you looking forward to trying most?